Hey there, cool kids! We’re back with another installation of our cooking party recaps. These posts give you an inside look at what makes our culinary events so fun, and why hosts keep coming back for more. Now where did we leave off? Oh, that’s right: January. Let’s kick things off with a Sumptuous Small Plates event with Nomis Solutions Software. 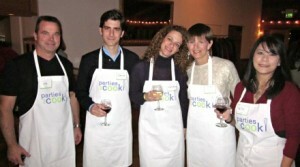 Thanks to “great Yelp reviews” and “better food options”, host Valerie G. decided to give Parties That Cook a try. The group of about 30 came together under the guidance of lead chef, Irfan, in one of our favorite venues, Dacor Kitchen! After the event, Valerie seemed very pleased with her decision! “Everything was amazing — from working with [event planner] Christina to menu options, great on-site staff and organization,” she said. “Everything was perfect!” We’re so glad we were able to make everything work, Valerie! That same day, in Chicago, OMSNIC hosted it’s very own Small Plates event (emphasis on the small). This group of 9 may have had doubts about their cooking abilities, but in the end, found THEIR food “delicious and perfect”! According to the host, Leslee H., “Everyone was pleased with themselves and their co-workers. It was a great way to unite our group and start our training session off right – showing them that often times projects look more challenging than they actually are, particularly if you are working together.” We couldn’t have asked for a better take-away from a corporate event! These team building activities are all about building camaraderie while overcoming challenges together. The fact that groups get to enjoy a gourmet meal at the end of the event is just the cherry on top! Let’s check out another Chicago event, shall we? 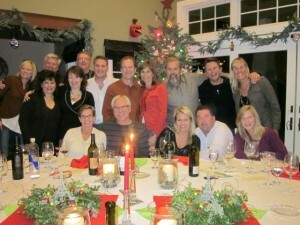 About one week later, SKF USA Inc. hosted a Sumptuous Small Plates event for 15 guests. Host Stacy R. selected a scrumptious menu including some popular skewered items: Spice Crusted Salmon Skewers with Harissa Yogurt Dipping Sauce and Whole Grain Mustard and Garlic Beef Brochettes with Kumquat Aioli. The verdict? “The food was delicious! !” Stacy was pleased to report that everyone gave positive feedback on the evening. “I thought the best part was having our leadership team work together in small groups and build bonding relationships in a relaxed atmosphere,” she said. That’s why we love our Sumptuous Small Plates event! If you’re looking for a relaxed evening of mingling and getting to interact with friends and coworkers, Small Plates is the way to go! Closing out the month, well, as far as this blog is concerned, is a PricewaterhouseCoopers Small Plates event for 50 guests! To keep the group down south, host Paula F. opted for the beautiful Dolce Hayes Mansion in San Jose. Lead chef Jed did a great job, as usual. “Jed was wonderful; very accommodating and great when working with the group,” according to Paula. The menu, which included such favorites as Canapés of Camembert with Olive Tapenade, Porcini Mushroom Tartlets, and Savory Cupcakes Lobster Macaroni Cheese, was a hit. Paula even confessed that she’s already looking forward to trying the recipes out at home! To sum it up, Paula added, “The food was great and working in teams to cook appetizers was a great opportunity to network with people we hadn’t met in person. Well organized, well run, accommodating and fun!” Thanks Paula! Now that all guests have received copies of the evening’s recipes, we hope everyone will continue whipping up tasty dishes! Kicking off this corporate event recap is a Chicago event for Sedona. 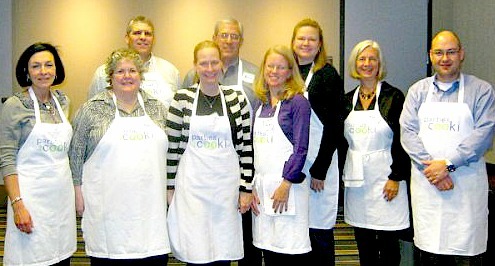 We know it’s going to be a fun group when employees are willing to come cook with us on a Saturday! 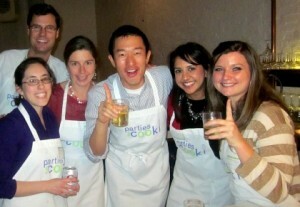 They even used our favorite Chicago venue for public cooking classes: Charlie Baggs. Sedona host, Guy N., selected the perfect type of event for his group that “loves to compete in unique areas.” After this Kitchen Challenge, Guy raved, “The chef’s were terrific – they were the highlight of the event. Even with this lively of a group, they handled things warmly and encouraged trying new things. They were fun, helpful and kept things on track while teaching and encouraging the interaction. The event offered a wonderful interaction and experience, and the knowledge gains were terrific.” Nicely done, Chicago team! Menu items included Soft Pretzel Bites with Spicy Mustard Dipping Sauce, Broccoli Chive Soup with Lemon Cream, and Carved New York Strip Steaks – YUM! 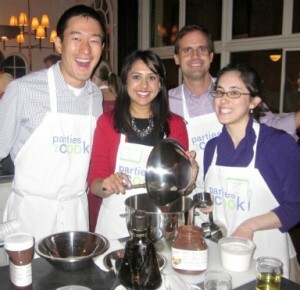 Shanna added, “This event was also successful because we all thoroughly enjoyed our meal! The chefs were extremely helpful and were always there to lend a hand when needed. Everyone was able to join in and cook a little bit of each dish, and we were all able to sit together and enjoy dinner as a team.” Shanna mentioned that she thought an all appetizer or all dessert party would be fun to try. You’re in luck, Shanna! Check out our Sumptuous Small Plates event (available with a competitive add-on) and our newer event: Cupcake Wars! 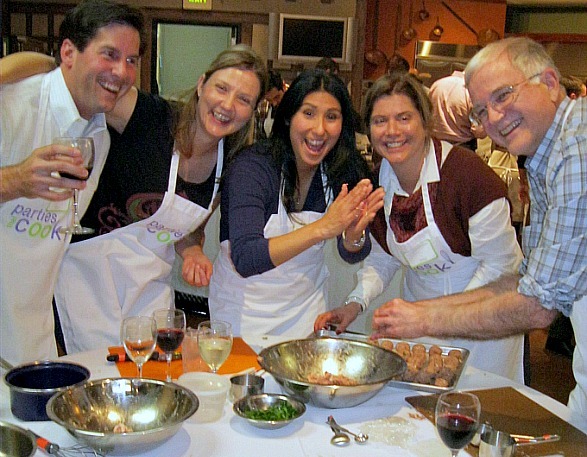 That very same day, our crew brought the Parties That Cook mobile kitchen to a private home in Los Gatos, CA. XL Construction Group hosted a Chef’s Table event with a mouthwatering menu featuring Canapes of Camembert Olive Tapenade, Crab and Red Pepper Beignets, and Parmesan and Herb-Crusted Filet Mignon. Repeat host, Kate P., came to us after having seen us in action with her previous company! About her experience this time around, she said, “As usual, the event was great! Everyone loved both the cooking experience and the eating. The staff was excellent. Our chefs – Heather and Amy – were terrific, as was our server Elizabeth and our dishwasher, Dana. It was a great menu — fun to cook but not too challenging (just right!) — and the food was delicious. Love you guys! Easy, good, entertaining! We’ll definitely do it again.” Wow. We just love when repeat clients…continue to repeat! After a week of twenty events, the week of SDG‘s 55-person Chef’s Table was like a walk in the park (13 events). Still, we had to bring our A-game. It was great to hear that the SDG host, Sharon S., thought we hit it out of the park! Big thanks to all our corporate event hosts who allowed us to use their comments and wanted to be featured in one of our blogs! We’ve received a lot of feedback over the years, including recipe notes, venue comments and ideas for new events (barbeque, sushi, and pasta from scratch, just to name a few)! You never know, your next suggestion could end up being our next hit event (Ahem, Cupcake Wars..), so keep ’em coming! 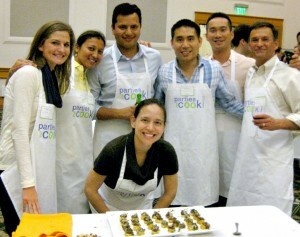 Next up: 2012 Corporate Team Building Events and Private Cooking Parties!